Identify the style of your antique and reproduction furniture from your iPhone or iPad. Product History: August 2011 we released Furniture Styles for the iPhone and iPad. In January 2012 we release Furniture Styles for Android phones, tablets, and the Kindle Fire. You get the same matching technology we developed in 1997 for the desktop on your mobile device. Identify the style of your antique and reproduction furniture. Product History: Great news for 2011! 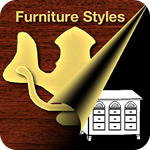 The Furniture Styles application is now available for download and immediate use on your Windows PC or laptop. The same features as our mobile app with the additional abilities to compare styles and save detail reports. First introduced in 2007, Connected Furniture Styles is a unique software application specifically made to identify the style of historic furniture. As of July 2011, you can safely and securely download an enhanced copy of this Windows application from our store at FastSpring. Product History: The Connected Pattern Maker has been enjoyed by artisans worldwide since 1997. We are pleased to offer the Connected Pattern Maker for use in your artistic endevours for free. Product History: Connected Lines has been providing free coloring pages made with the Connected Pattern Maker since 1998. We are pleased to offer our software to young artisans for free. We are unable to accept returns on software products. For support please send email. Connected Lines has been providing our customers with the convenience of online shopping since 1997. Connected Lines does not share or sell any personal information.